Flight runs throughout the 20th century, both figuratively and literally. For the latter, the 20th century was an immense moment of technological advancements leading to flight for first the few and subsequently, the many. But also, the 20th century was a time of immense social and cultural change. For the United States, it was a moment of progression for the many and the change that especially runs through the latter half of the century still affects the policies and interactions between people today. The Massachusetts-based Double Edge Theatre addresses this concept head on in their latest production, The Grand Parade (of the Twentieth Century), closing tonight at The Dance Center of Columbia College. 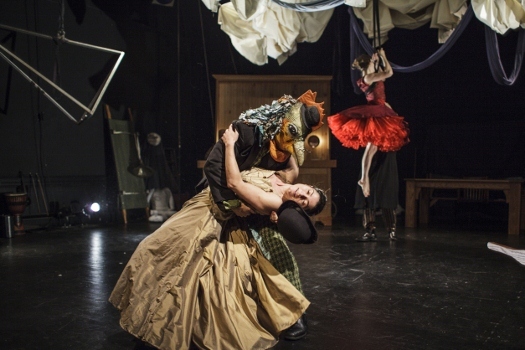 The work is an original, multi-disciplinary piece of theatre that incorporates choreography, aerial flight, puppetry, and circus arts and is part of a larger work entitled The Chagall Cycle. Conceived and directed by Artistic Director Stacy Klein, the show also includes an original score by Russian composer Alexander Bakshi. In addition to their own work, six Columbia College students were also chosen by a team from the theatre to rehearse at the company's artistic home, the Farm, in Ashfield, Massachusetts, and participate in the show. "It's not so much that we're teaching them puppetry as it is we're teaching them a way of seeing and a creative process," company member Jeremy Louise Eaton said. "It is a way of seeing your work, of being autonomous in your work, of being self-sufficient with your work." In the end, audiences can expect an imaginative, dream-like final product that is as eclectic and complicated as the 20th century itself. "Who would I have been? Who would I have wanted to be?" asked Eaton when conducting research for the work. Each performing member researched figures, objects, or ideas prevalent throughout the decades of the past century to help shape the resulting performance work. Eaton focused on specific people such as the Suffragettes, Amelia Earhart, and Ethel Rosenberg. Throughout the research, Eaton discovered a common thread of flight or the pursuit of change which further solidified the themes of the show. "The people are a metaphor for a voice of something larger than themselves," said Eaton. "They stood as metaphors, as ways of asking questions, and ways of looking at the world." In the end, they have worked through archetype, story, and event to create their own myth of what that time was and what it means currently. The Grand Parade (of the Twentieth Century) concludes tonight at The Dance Center of Columbia College. The Dance Center is located at 1306 South Michigan Avenue and the show begins at 8pm. Single tickets are $30 and can be acquired by phone at (312) 369-8330 or online.